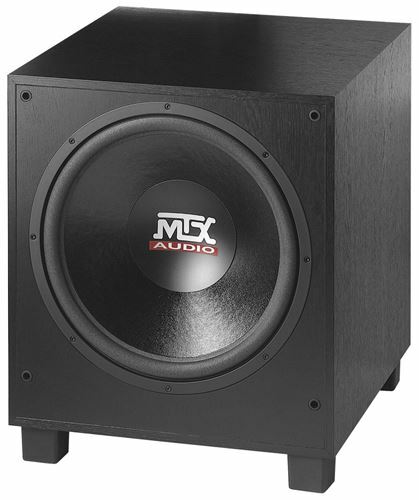 This powerful fifteen inch subwoofer can rattle the windows with its superb low frequency response. The SW1515 powered subwoofer was created to meet the needs of the demanding audiophile while delivering the dramatic Low Frequency Effects (LFEs) that are essential to any complete home theater. It includes an Active Compression Circuitry that can deliver teeth rattling low frequencies without break up or coloration. "I have always loved MTX products!!! I had the 12" surround sound enclosure for years and it went out. So I looked all over for another and ran across your sight and seen the 15" and I had to have it!!!! Would trade it for nothing in its class!!!!" The SW1515 powered subwoofer was created to meet the needs of the demanding audiophile while delivering the dramatic Low Frequency Effects (LFEs) that are essential to any complete home theater. It includes an Active Compression Circuitry that can deliver teeth rattling low frequencies without break up or coloration. This technology evaluates the input signal and protects against harmful spikes to avoid clipping. While bigger than the other home subwoofers, it also features a powerful Class D Amplifier that allows a higher output at lower frequencies and boasts 250 watts RMS power.